Google chrome is the #1 browser through world wide. It has enormous features including incognito mode. With Chrome incognito mode you can browse anonymously without saving your browsing history and other traces like cookies on your computer. Then click apply and OK button. 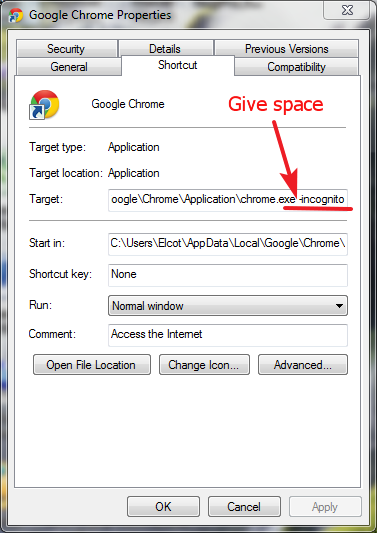 Now launch your chrome browser automatically it opens incognito mode. Now you can browse internet anonymously with out saving your browsing history. If you do not want to open incognito mode at default go to same window and delete -incognito word that you added before.